Robert Plant has announced that he is taking his Grammy-nominated Band of Joy out on the road for an American tour beginning in April. The band will be playing large theaters mainly in the Midwest and on the West Coast. Last week, Rounder Records released a second music video from Robert Plant and the Band Of Joy, the Barbara Lynn song You Can't Buy My Love on YouTube. The video features black & white footage from the Band Of Joy's concert at the HMV Forum in Kentish Town, London, England on September 02, 2010. After being named best rock band by Planet Rock, Black Country Communion comes right out of the studio from recording their second album to announce six new tour dates coming to Germany starting at the end of June and going into July. They also have a date to play The High Voltage Festival in London, England. Hailed as the saving grace for Rock and Roll, these tour dates are going to sell fast. Don't miss out on the hottest rock tour this year. For tour dates and ticket links check the Black Country Communion homepage. 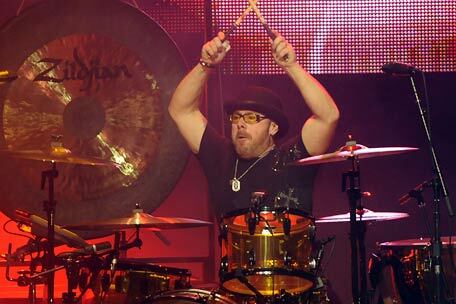 One of the last things Jason Bonham, son of late Led Zeppelin drummer John Bonham, remembers his dad saying to him was, "You're going to get into the drums again, aren't you?" A teenager utterly obsessed with motocross racing and about to sign a professional contract, the younger Bonham had other plans for his future. It was only after his father's untimely death that he began to follow in his footsteps. "I lost him when he was my idol, and he still is," Bonham, whose Led Zeppelin Experience band finished touring North America last month, tells Spinner. Although deep into other hobbies in his adolescent years, Bonham had been playing the drums since he was young but wasn't too fond of music until a year or two before his father's passing. However, he still recalls times spent going to see his favourite bands of the time with his dad. "He took me to see the Police when they had just done a second album, so they were still quite fresh. I thought Sting was the coolest thing in the world," Bonham recalls. "He managed to get me backstage and he threatened to punch Sting. It was hilarious. Dad stepped on his foot and he [Sting] was very cocky back then. He was the new young frontman and had that punk kind of attitude. Dad was probably a dinosaur to him, even at 32. I remember him saying, 'Hey man, don't step on my blue suede shoes.' My dad said, 'I'll step on your f---ing head in a minute.'" Bonham and his other musical project Black Country Communion released their self-titled debut LP last September, however this past tour playing Zeppelin songs alongside guitarist Tony Catania, bassist Michael Devin, keyboardist Stephen LeBlanc and vocalist James Dylan saw him, as he says, "playing better than I've ever played in my life." No stranger to critics, Bonham says he's always reading music blogs looking for negative reviews or people knocking him for playing songs by his father's former band. To naysayers he offers this: "It's my lifeline to my dad." Previously, he revealed Kashmir is his favorite Zeppelin song to play, and says Physical Graffiti, the 1975 album that features the track, is also his favorite Zep record. "I just love the diversity of the songs," he says. "One after another, they're all fantastic. Presence is also a close second for me because it's one of most underrated ones they did. 'Tea for One,' you put that on at full blast in a dark room, the solo that kicks in, you're transformed. I just got back into that again, and I was like, 'Wow!'" Guantanamo (Solvision).- British musician Jimmy Page, former guitarist for the legendary rock band Led Zeppelin, made a surprise visit of several days to Cuba. Prensa Latina learned that the 67-year-old rocker left Cuba on Monday after a visit that included tours of historic sites, and purchases of souvenirs such as the famous photograph of Che Guevara taken by Alberto Korda and albums by local artists. Page, who co-wrote the famous song Stairway to Heaven with singer Robert Plant, stayed at old Havana's Hotel Saratoga, which has housed other international figures of rock and roll. Led Zeppelin has inspired many Cuban bands and has its own following on the island. After learning Page was visiting, a number of local musicians tried to meet him. Musicians from the local band Tesis de Menta, a flagship of rock in Cuba, and well-known radio host and vocalist Juan Camacho, fulfilled their "dream" of meeting and talking with Page last Saturday. After being mobbed in the hotel lobby, Page, dressed in shorts and a black T-shirt, talked for almost 20 minutes with the Cuban musicians about different aspects of his career. He was interested in the work of the theatre Maxim Rock, headquarters of the Cuban Rock Agency, and the influence of Led Zeppelin on the local scene. Tesis de Menta singer Beatrix Lopez told Prensa Latina that Page, "with a youthful spirit" and "very strong," talked about his friendship with the British guitarist Jeff Beck, who was part of the celebrated band The Yardbirds in the 1960s. He passionately praised the work of the Belgian singer with Arab roots Natasha Atlas, considered a cult figure in the European underground scene. Perdomo, leader of the band Tesis de Menta, added that the former Led Zeppelin guitarist, whose solo for Stairway to Heaven was selected the best in history by Rolling Stone magazine, expressed interest in Cuban rock and the different genres on the island. Page founded Led Zeppelin in 1968 in 1968 with Plant - who incidentally visited Cuba some years ago - bassist John Paul Jones, and drummer the late John Bonham. The band, one of the most influential of all times, separated in 1980. Since then, members of the group have reunited only on special occasions. Their last reunion was in 2007 in a London stadium, where they performed a concert in honor of the man who discovered Led Zeppelin and founded Atlantic Records, Turkish-born Ahmet Ertegun (1923-2006). After that show, rumors circulated about their possible return to the stage, but for now, the band has not reunited. Members of the cult to Led Zeppelin all over the world, however, continue to wait hopefully for that possibility.